Hello there! 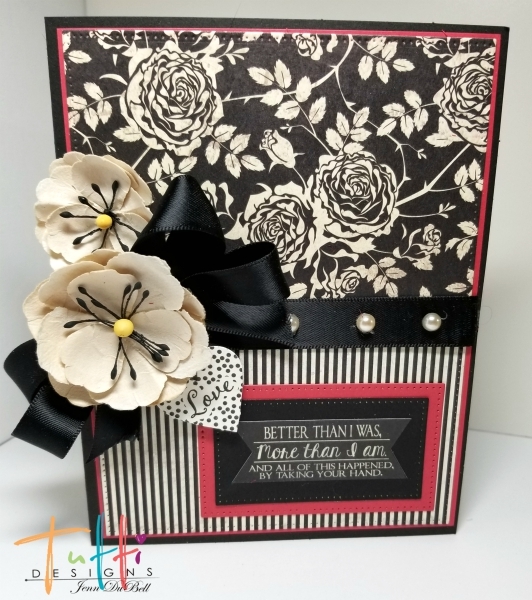 Jenn here today sharing an elegant Wedding card I created using the amazing Tutti Designs Dies! 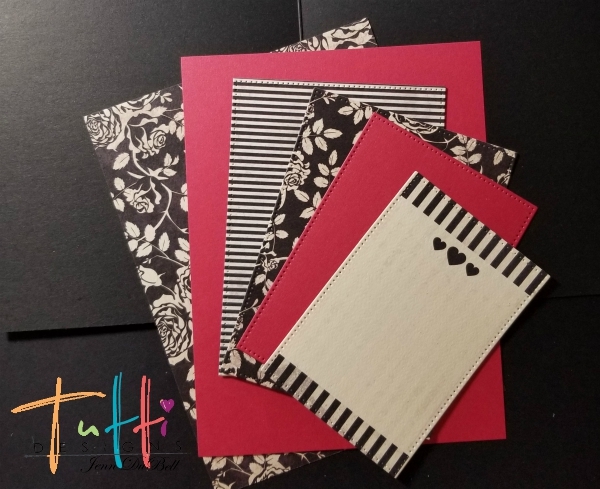 I have a friend getting married soon and she likes simple and elegant design, so I thought ivory, black, and red! 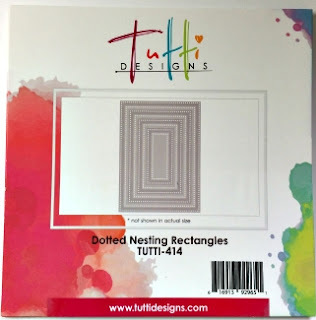 The Dotted Nesting Rectangle dies from Tutti are perfect for creating the right sized rectangles to create the clean lines of my card. I chose papers from the Authentique Always collection. The dies I used are available by clicking the photo below. This is a set of 8 dies of different sizes. 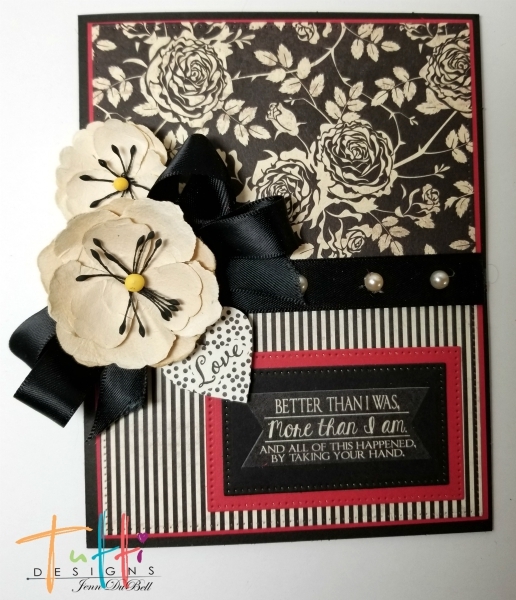 To create my card I started with a basic black 5" X 6 1/2" card base. 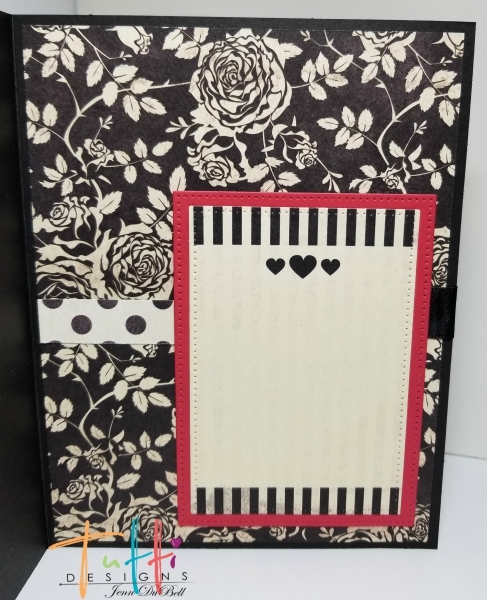 For the sentiment there are two die cut rectangles. Red 3.125" X 1.875", and black, 2.75" X 1.875"
Patterned - 4 3/4" X 6 1/4"
Red - Dotted rectangle die 4.25" X 3.00"
I used the 3.875" X 2.625" Die on a cut apart page for the next layer with the hearts on top. I always assemble my card insides first. This way the front does not get wrinkled. Once the inside was assembled I used black satin ribbon to wrap around from the back of the card to the front. I added a bow from the same black ribbon. Next a couple of ivory Prima flowers were added and some pearl bling pieces. Lastly a heart cut out from the paper collection! All papers were adhered using Xyron mega runner tape gun. Flowers were adhered using hot glue and the heart was popped up using a 3D foam adhesive dot. There you have it! A simple yet elegant card! Thanks So Much for visiting the blog and viewing my post today!! OH SO PRETTY! Beautiful creation and awesome inspiration! Nicely done, very elegant, and love the inside as well.